In 1991, my husband, our toddler and I rented a beach cottage in Kill Devil Hills, N.C. It’s the same cottage we still get almost every summer. Over the years, the owners have upgraded the cottage with assorted amenities but, in 1991, it was pretty rustic. No dishwasher, no microwave, no air conditioning. Worst of all, no TV. There was, however, a cassette tape player. When we arrived with our two-and-a-half-year-old, we thought the absence of a television would be a plus. That is, until we realized we had one cassette tape. For the whole week. 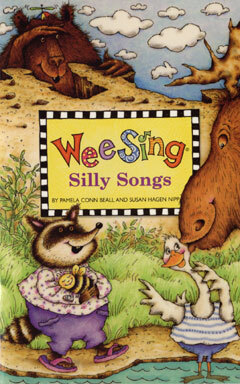 It was Wee Sing Silly Songs. The three of us must have played that tape—and sung along, with hand motions—20 times or more that week. Got to know all the silly songs by heart. Who can forget the classic “John Brown’s Baby?” Or as our son sang it, “John’s brown baby.” He had a cold upon his chest, and they rubbed it with camphorated oil. Oh, what did Delaware, boys? What did Delaware? She wore her New Jersey, boys. She wore her New Jersey. I know that, in years to come, when we are in The Home, drooling in the corner and unable to remember our own names, we’ll still remember the lyrics of the great children’s songs. I’ll have to be sure my son has a copy of “Silly Songs,” in whatever format it will be then, to play for me when I’m old. My brothers and I grew up on Irish drinking songs and versions of children’s songs that weren’t yet scrubbed of their political incorrectness. Didn’t we all? The big baboon, by the light of the moon, was combing his auburn hair. The monkey he got drunk. He fell on the elephant’s trunk. And what became of the monk? Then there were the songs we learned on the playground, such as “Miss Lucy Had a Steamboat.” We thought we were so cool because the lyrics allowed us to curse without cursing. Tra la la boom di-ay, there was no school today. Our teacher passed away; she died of tooth decay. We threw her in the bay; she scared the fish away. And when we pulled her out, she smelled like sauerkraut! What songs comprised the soundtrack of your childhood? Tagged as beach cottage, children's music, children's songs, I Went to the Animal Fair, John Brown's Baby, Miss Lucy Had a Steamboat, song lyrics, Tra-la-la boom di-ay, vacation, Wee Sing Silly Songs, What did Delaware? There is no school today! Teacher hit me with a ruler. And the [something, something] marching on. Were sittin’ in the corner shootin’ dice. And the flea said, that’s a horse on me! And if you don’t like me just leave me alone. If the whiskey don’t get me I’ll live ’til I die.